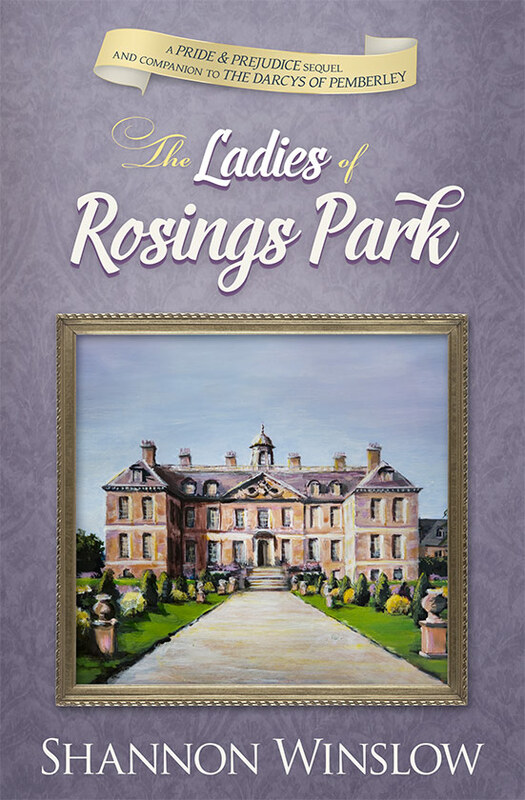 Today I’m welcoming author Shannon Winslow to From Pemberley to Milton with a guest post about her recently released book The Ladies of Rosings Park. This is the 4th novel of the Darcys of Pemberley Series and focuses, as the name indicates, on the ladies who live in or near Rosings Park, but I will let you read the blurb and guest post to learn more about it. Enjoy! Complete in itself, this work expands The Darcys of Pemberley series laterally, beginning during the timeline of Pride and Prejudice and carrying beyond to reveal the rest of Anne’s story. When a young lady is to be a heroine… something must and will happen to throw a hero in her way. (Jane Austen, Northanger Abbey). The Ladies of Rosings Park is primarily Anne de Bourgh’s story, and staying true to what Jane Austen wrote about her was my prime directive (to put it in Star Trek terms). Anne might imagine all sorts of things – and she does! – but she’s prevented from doing anything to contradict the original story in Pride and Prejudice. It’s only after Darcy and Elizabeth ride off together into the sunset that she is free to invent her own life and find her HEA. In the meantime, in the early chapters, she’s stuck where Jane Austen left her – unseen and unheard, living perpetually in the shadow of her domineering mother. As Anne herself tells us in this new book… although Rosings is an extremely large house, there is room for only one person to exert the force of her will and opinions. And that person is my mother, Lady Catherine de Bourgh. But what if these constraints were removed? What if neither Anne nor I felt obliged to abide by the “non-interference” clause? What if she were allowed to not only imagine, but act as she pleased from the start? Although it would have been difficult to sustain the mash-up mentality for the length of an entire novel, it’s fun to see what happens when you try it out even temporarily. So here’s a P&P scene at Rosings that I include in the book, now re-imagined – what might have happened if Anne had been able to let down her hair and cut loose a little sooner. Anne’s telling the story, and I’ll leave it to you to figure out where and how far it deviates from what I actually wrote in The Ladies of Rosings Park! Mama droned on and on with no intermission, Darcy and I speaking only when asked some question requiring a response. Every minute, however, my attention was drawn across to the other side of the room, where Elizabeth and Fitzwilliam were entertaining one another in so spirited a manner that it could not be ignored. I was hardly the only one to have noticed either. Darcy’s eye repeatedly turned that way, I observed, and finally so did Mama’s. “What is that you are saying, Fitzwilliam? What are you telling Miss Bennet?” she demanded. “We are speaking of music, Madam,” he answered. This solicited from my mother a long speech on the subject, ending in a query as to how her niece was getting on. I could only look at Elizabeth and roll my eyes to show how I sympathized. It was all the more remarkable, then, that after Mama’s insult Elizabeth consented to play for us later that evening. This having come about by Fitzwilliam’s particular request, he settled in a chair beside her to turn the pages. But then my other cousin broke from our group and made his way into the next room as well. I cannot say whether it was for a better view of the pretty performer or only to separate himself a little from Mama. In any case, the three of them were soon carrying on together, Elizabeth’s music punctuated by pauses for conversation. From my location, I strained to hear even an occasional word. I could see quite well enough, however: an arch look from Elizabeth, some explanation from one of my cousins, a laugh in return, a comment to the other, a smile exchanged between two or all three. The gentlemen were clearly enthralled. How effortlessly Elizabeth had managed to captivate them! I longed to join in – to be a part of their talk and laughter, possibly even to flirt a little as I had seen others do. And yet, there I sat, meekly by Mama’s side with my hands folded in my lap, keeping to my customary wallflower part and allowing another to thoroughly eclipse me in the eyes of the man who was supposed to have become my husband. It was not so much that I coveted Darcy’s attention myself or that I resented Elizabeth’s allurements; I just hated being perpetually unseen, unheard, and completely left out. Suddenly I could bear it no longer. Perhaps emboldened by having got away with speaking my mind earlier, I decided then and there to do something about it. So I shot to my feet before I could change my mind. As daring as you please, I marched right up to the three gathered round the piano-forte, which instantly drew their full attention. Shaking my head, I gave my cousins a look of mock disapprobation. “I have come to stand beside my friend Elizabeth in her time of need,” I told them. “For it seemed to me as if the two of you were teasing her without mercy. I think you will behave better, now I am here and our numbers are equal. Elizabeth, how can I be of assistance? We ladies must look out for one another’s welfare, to face down every attempt by men to intimidate us. Is not that so?” Then I laughed playfully to show that I was in fact teasing too. The gentlemen were left quite speechless at first, amazed (and possibly impressed?) that timid little Anne had the temerity to behave in such an astonishing way. With me enthusiastically leading the way, the others soon joined in. I daresay Mama did not approve. I think I heard her complaining in the background – something about such ‘common’ songs only being suitable for public houses, sung by travelers and serving maids. But what could she do? It was four against one. We just sang all the louder until she was finally chased away to bed! So what do you think? Believable or not so much? How far do you think Anne would really go? If you like this new, bolder Anne, I can promise you that she learns to stand up for herself before all is said and done, just not this early on. I hope you’ll also check out a mash-up I wrote about what happens when she crashes Georgiana’s birthday ball. The giveaway is open until the 13th of April and the winners will be announced shortly after. Oh, I love that cover. I also have the other 3 and now I must have this one too. I’ve followed it on the website and loved it. I am so excited that it is finally published. Congratulations on the launch Shannon an I wish you much success. If I do not win a copy from the blog tour… never fear… I’m purchasing myself a copy. Thanks to Rita for hosting and good luck to everyone in the drawing. Blessings to those who celebrate the Easter holiday. May peace be in your home and joy at being together. Must add this to my MustReads! I always enjoy Shannon Winslow’s books. I love this teasing and talkative version of Anne. She certainly can use more self-confidence so that she can stand up to that mother of hers! Thanks for the chance to win a copy of your newest, Shannon! I love your books! Pingback: The Ladies of Rosings Park – Debut and Blog Tour | Shannon Winslow's "Jane Austen Says…"
I’ve not read the series but I love it when Anne gets a backbone. I want to cheer Anne on! I enjoyed the excerpt and look forward to reading more. Yes, this is a very different Anne and it will take me some time to get used to her. I read the excerpt of attending Georgiana’s 18th birthday ball and could not believe the change. This book will prove very interesting. I wonder how Lady Catherine will react to these changes. Thank you for the giveaway. I have been enjoying this story very much! Thank you for writing it, and for the chance to win! I so enjoyed the possibility! Looking forward to Lady Catherine’s great shock!! I really do want to read this book. Even if I don’t win a copy I will get to it sooner or later. Thanks for sharing. I love it that we get a changed and improved Anne de Bourgh. I would like to see her shine and grab the spotlight after Darcy and Elizabeth’s marriage. She deserves her own happy ending after staying in her mother’s shadow for a long time. All of your covers in The Darcys of Pemberley series are beautiful, Shannon.